Return To A Galaxy ... Far, Far Away. Episode VI: Return Of The Jedi: In the epic conclusion of the saga, the Empire prepares to crush the Rebellion with a more powerful Death Star while the Rebel fleet mounts a massive attack on the space station. Luke Skywalker confronts his father Darth Vader in a final climactic duel before the evil Emperor. In the last second, Vader makes a momentous choice: he destroys the Emperor and saves his son. The Empire is finally defeated, the Sith are destroyed, and Anakin Skywalker is thus redeemed. At long last, freedom is restored to the galaxy. $30.490 million on 1002 screens. Because the Star Wars “Prequel Trilogy” - 1999’s The Phantom Menace, 2002’s Attack of the Clones and 2005’s Revenge of the Sith received so much negative opinion, folks tend to forget the moderately lukewarm reception to 1983’s Return of the Jedi. To be sure, many people really liked Jedi and it certainly raked in lots of money. As with predecessors Star Wars and The Empire Strikes Back, Jedi was its year’s biggest-grossing movie. However, after two classic flicks, Jedi seemed less scintillating to many fans. Personally, I think it does have its flaws and qualifies as the weakest of the “Original Trilogy”, but Jedi remains too much fun for me to worry a lot about those problems. Note that because Jedi comes as the last part of a trilogy, my review inevitably will include some spoilers. Honestly, I doubt too many readers won’t already know these movies well, but if you fall into that category, you’ll probably want to skip my synopsis and movie discussion entirely. Jedi starts not too long after the conclusion of Empire. At that time, the situation left Han Solo (Harrison Ford) frozen in carbonite and a prisoner of gangster Jabba the Hutt. Led by Jedi-wannabe Luke Skywalker (Mark Hamill), our gang rescues Han from Jabba’s clutches and rejoins the Rebel Alliance’s battle against the Empire. As part of this, we learn that the Empire toils to build another Death Star, the enormous battle station the Rebels destroyed back in Star Wars. Apparently the Empire learned at least one lesson in the meantime, as they put a protective force field around the new Death Star. The source of this sits on a moon called Endor. The Rebels need to send a team to knock out the field so that a squadron led by Lando Calrissian (Billy Dee Williams) can blow up the new Death Star. Our old pals Han, Luke, Princess Leia (Carrie Fisher), Chewbacca (Peter Mayhew), and droids C-3PO (Anthony Daniels) and R2-D2 (Kenny Baker) assist in this assault. Essentially the rest of Jedi follows three paths. Due to his connection to Imperial baddie Darth Vader (David Prowse, voiced by James Earl Jones), Luke eventually realizes that his presence acts as an impediment to the team. He gives himself up to lead to a final confrontation with Vader and the Emperor (Ian McDiarmid) in which Luke intends to redeem Darth. Back on Endor, the Rebels see what obstacles they face and acquire some unlikely allies via the moon’s native population, the little, fuzzy, cute and cuddly Ewoks. After some initial tension, the two sides make friends and find that the primitive Ewoks help with their battle against the Empire. As Han and company struggle to disable the force field, Lando leads the Rebel soldiers to attack and destroy the Death Star. I think the complaints about Jedi essentially fall into two categories: “déjà vu” and “teddy bears”. By the release of Jedi, the Star Wars series was well established as an enormously profitable franchise. This included every kind of merchandise one could imagine, so when Jedi revealed the adorable Ewoks, cynics immediately pounced on George Lucas as they believed he created those characters largely to move product. Could be, but I think the Ewoks inspire much more malice than they merit. Lucas originally planned to ally the Rebels with Wookiees, but that became impractical due to our understanding of Chewbacca. Whatever species the Rebels met needed to be very primitive and low-tech, but we already knew Chewie as a technologically savvy dude, so that couldn’t work. Did the species encountered by the Rebels need to be a shorter, more adorable take on the Wookiees? Probably not, but I don’t see this as a significant flaw, though the flick does indulge in too many cutesy moments. As for the “déjà vu” element, that stems from the feeling that Jedi did little more than reprise the better parts of the first two parts of the “Original Trilogy”. After all, the film’s climax essentially reworks the endings from both of the earlier movies along with new elements via the Han/Leia/Ewok rebellion. This sense of repetition does taint the film slightly, as it makes Jedi seem a bit less creative. However, the packaging of the conclusion works awfully well. Jedi cuts from one scenario to another smoothly in a way that helps stoke the excitement levels. The climactic confrontation with Luke, the Emperor and Vader works particularly well. Yeah, we already saw Luke vs. Darth in Empire, but the third participant deepens matters, and this sequence becomes especially dramatic. The other two parts appear less dynamic, and the attack on the Death Star particularly suffers from “second stringer syndrome”. Lando is the sequence’s best-known participant, and he never became more of a secondary character; the others involved in that sequence don’t even become that important and remain tertiary. The assault loses something since it doesn’t involve any of our primary participants, but that doesn’t stop it from becoming exciting and dynamic. Really, the sense of fun is what keeps Jedi going. Of all the three flicks in the Original Trilogy, it definitely stresses action the most heavily. This comes at the expense of character and plot development, as Jedi displays the cartooniest exploration of its story. That comes as a particular disappointment after the relative depth of Empire, and it fares poorly even in comparison to the character delineation of Star Wars. Given the issues that affect the main personalities, the way it gives their growth the short shrift seems bothersome. Note that this Blu-ray of Return of the Jedi presents an updated version of the flick. Many of the changes came with the 1997 “Special Edition” but Lucas continues to tinker with the movie, so some additional alterations appear here. If you want a detailed examination of the changes, throw a stick anywhere on the Internet and you’ll find 100. I won’t get into that, as instead I’d prefer to provide my general impressions of the changes. Jedi falls between Star Wars and Empire as far as its degree of alterations. The first flick includes the most differences when compared to its initial theatrical version, while Empire’s changes remain fairly modest. Jedi represents both the good and the bad of these alterations. On the negative side, we find the absurd “Jedi Rocks” song during the first act. Set at Jabba’s Palace, this replaces the “Lapti Nek” musical number that originally appeared in the flick. That one wasn’t great, but “Jedi Rocks” is ridiculously bad. In fact, it’s the single worst element to appear in the Original Trilogy and should embarrass all involved. I can’t say I’m wild that this edition’s ending replaces Sebastian Shaw as the Anakin ghost with Hayden Christensen, but it doesn’t annoy me too badly. Some of the alterations advance the film, however. For example, the visual effects get a generally nice touch-up, with the biggest improvement seen during the Rancor scene in Jabba’s Palace. That segment’s rear projection effects never worked well, and they appear substantially more convincing here. Many others disagree, but I definitely prefer the Blu-ray’s ending song to the old Ewok “Yub Nub” number from the original movie. Although I never developed a real dislike for the Ewoks, I did always hate that damned tune, and the newer one gives the film a more melancholy and emotional conclusion. It’s not a great number but it certainly betters “Yub Nub”. George Lucas refuses to leave his flicks alone, so the Blu-ray delivers a few additional changes not found on the DVD or the 1997 SE. For reasons unknown, the Ewoks now blink. Actually, I suspect I know the reason: to add believability to the characters. Does it work? Not really, though it’s not a big distraction. The Ewoks’ eyes are so dark that it’s often tough to see the blinks anyway. It’s a pointless change but not a harmful one. In addition, Vader now bellows “nooooo!” when he stops the Emperor at the movie’s end. I do understand the rationale behind this alteration, as it allows Vader to tie into his reaction at the end of Revenge of the Sith. Nonetheless, it’s another example of fixing something that’s not broken. Do I hate the change? No – it’s not as off-putting and silly as the new howl Obi-Wan makes in Star Wars. But it’s still an alteration that serves no real purpose and doesn’t help the film. Like most fans, I’d prefer to be able to see the movie essentially as originally released in 1983. Nonetheless, it remains a fun ride. I could live without many of the changes, but they don’t cause terrible harm to the film. Return of the Jedi appears in an aspect ratio of approximately 2.35:1 on this Blu-ray Disc. Though usually terrific, the transfer had a few more mild issues than its predecessors. Sharpness was the only minor concern. While most of the movie provided solid clarity, a few exceptions occurred. As in the past, most of these came from the intersection of visual effects/matte paintings and live-action characters, but some mysteriously ill-defined elements appeared as well. For instance, the early shots on Endor displayed a lack of clarity that didn’t make sense. These instances of softness weren’t major, though, so expect the majority of the flick to look positive. Issues with jagged edges and moiré effects failed to show up, and I still didn’t detect any signs of edge enhancement. As with the first two flicks, no print flaws marred the presentation. Given that much of the movie took place on Endor, greens played the most prominent role in the palette, though a nice mix of other hues popped up as well. Sandy tans were dominant on Tatooine as well. Across the board, the film replicated the various tones succinctly and vividly. The colors always came across as vibrant and full. Black levels continued to satisfy, as they were deep and developed, and low-light shots remained appropriately opaque but not too dense. The occasional soft spots were a mild distraction, but I still felt quite pleased with the vast majority of the transfer. As for the DTS-HD MA 6.1 soundtrack, it felt like a virtual clone of Empire’s audio in terms of scope, quality and consistency. Star Wars had more than a few erratic moments, but its two successors maintained a high degree of stability. The soundfield once again created a full and involving setting. Music featured concise and broad stereo imaging, while effects spread convincingly across the various speakers. As usual, space flight scenes used the channels to the greatest advantage, as the crafts flew and zipped around the room well. Other segments also brought the mix to life. Elements were logically placed and connected cleanly to create a detailed soundscape. Audio quality worked very well too. Speech was always distinctive and crisp, with no issues connected to edginess or a lack of intelligibility. Music appeared dynamic and bright, as the score featured tight highs and natural lows. Effects continued to sound clear and clean. They delivered accurate representation of the elements that featured good detail and range. Bass was warm and lively. I often found it hard to believe that the soundtrack emanated from a 1983 film, as it didn’t show its age at all. How did the Blu-ray compare to the original 2004 DVD release? Audio was smoother and clearer, and visuals appeared better defined and more vivid. Even with the occasional soft shot seen here, the image was an obvious improvement over the DVD. 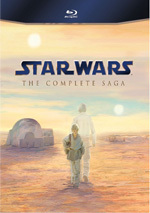 This Jedi Blu-ray comes as part of a nine-disc package called “Star Wars: The Complete Saga”. 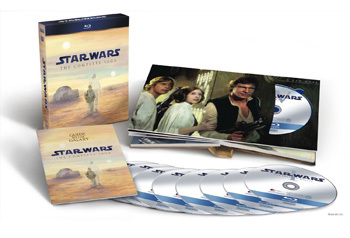 It features one disc each for the six movies and three additional platters of extras. Because so many of the film’s supplements show up on other discs, I won’t give Jedi a specific grade for its bonus materials. I’ll wait until I get to a single “wrap-up” page to look at the three discs and award an overall supplements mark. We do find some extras here, though, via two audio commentaries. The first comes from the original DVD and features story writer/producer George Lucas, sound designer Ben Burtt, visual effects supervisor Dennis Muren, and actor Carrie Fisher. All four were taped separately for this edited track. As they discuss the final chapter of the trilogy, technical issues dominate. Lucas talks about the ways the series used and broadened those elements and also goes over issues connected to the challenges presented by the tale’s final chapter. Lucas spends some time on story concerns and character developments. One also gets the impression Lucas essentially directed Jedi. At the commentary’s start, he mentions that he played a more prominent role than typical for an executive producer and likened it to functioning that way on a TV; he implies that Jedi director Marquand had little say in the proceedings and just did Lucas’s bidding. That impression didn’t come through during the Empire commentary, partially because Irvin Kershner was there to have his say. Marquand died only a few years after he did Jedi, so he’s not here to defend himself. However, since Lucas often mentioned Kershner’s involvement in the film on that track and almost never discusses Marquand here, I still come away with the impression that the latter was a very junior partner. Burtt plays a more prominent role and offers many fun notes about the sources of his recordings; who knew the Rancor was actually a dachshund? He also gives us a terrific exploration of how he helped develop the Ewok language. Muren also participates a little more actively than usual as he tells us about the creation of the visual effects. Unfortunately, Fisher again doesn’t chime in very frequently. When she speaks, she offers funny and incisive remarks, but she only pops up sporadically. The Jedi commentary stands as the weakest of the three, but it still provides a lot of useful notes and comes across as entertaining and informative. New to the Blu-ray, a second commentary collects material from archival sources. This one features George Lucas, Ben Burtt, Carrie Fisher, Dennis Muren, co-producers Robert Watts and Jim Bloom, composer John Williams, makeup designer Stuart Freeborn, modelshop supervisor Steve Gawley, visual effects artists Richard Edlund and Ken Ralston, stunt arranger Peter Diamond, chief model maker Paul Huston, concept artist Ralph McQuarrie, production designer Norman Reynolds, creature designer Phil Tippett, producer Howard Kazanjian, and actors Kenny Baker, Jeremy Bulloch, Anthony Daniels, Warwick Davis, Mark Hamill, Ian McDiarmid, Frank Oz and Billy Dee Williams. If you’ve read my reviews of the other six films, you’ll know this track mixes outtakes from the 2004 commentary sessions with other archival bits. Like the other new-to-Blu-ray pieces, this one works pretty well. It delivers a good look at a nice array of filmmaking topics and moves along at a good pace. No real weaknesses emerge in this enjoyable, informative track. Although Return of the Jedi stands as the weakest of the Star Wars “Original Trilogy”, don’t take that as a severe criticism. Yeah, the movie occasionally seems silly and immature, but it packs a lot of entertainment and finishes the series on a satisfying note. The Blu-ray gives us generally strong picture as well as excellent audio and a pair of informative commentaries. Jedi may be the least appealing of the original films, it’s still a fun flick, and the Blu-ray makes it come across well for home video purposes. Note that Return of the Jedi can be found in two different packages. As mentioned when I went over the supplements, my copy came from “Star Wars: The Complete Saga”, a nine-disc set with all six movies and three platters of extras. However, it also appears in a package called “The Original Trilogy”. That one only includes the three original movies: Jedi, 1977’s Star Wars and 1980’s The Empire Strikes Back. It throws in the audio commentaries found on the movie discs but none of the other “Complete Saga” supplements show up on it. It’s the way to go if you only want to own the original films – and I’m sure that’s a popular sentiment, as many people don’t care for the prequels - but realize that you lose a lot of extras in addition to the other flicks.